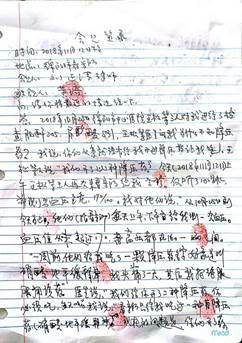 In the afternoon of November 12, 2018, lawyer Liu Zhengqing(刘正清) visited his client, Sichuan activist Huang Qi(黄琦), who is detained at the Mianyang Detention Center. Huang told his lawyer that in the morning that day, three doctors at the Mianyang Central Hospital came to the detention center to see him. They took his blood pressure which reached a dangerous high of 170/100. 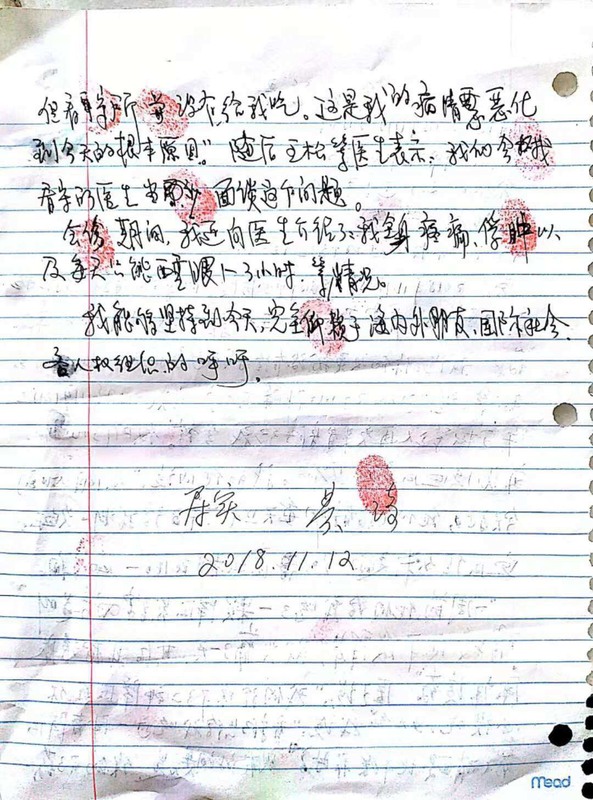 Huang believes that the detention center didn’t give him the medications the doctors prescribed for him, and this has caused his condition to deteriorate to this state today. Detained since November 2016, Huang Qi was indicted in January. But the authorities have not yet brought him to trial. See Huang Qi for more information. Answer (Huang Qi): On October 25, 2018, Dr. Wang Song and other two doctors from Mianyang Central Hospital gave me an examination: creatinine 205; uric acid 531. Doctors Wang Song et al. asked me why I didn’t take the hypertension medication. I said: You never prescribed any hypertension medication for me to eat. They said: "We prescribed this kind of hypertension medication." This morning (November 12, 2018), Wang Song and the other two doctors came to the detention center again to see me. They only listened to my heart rate and took my blood pressure which was dangerously high: 170/100. I said to them: "From October 25th to today, the detention center has been measuring my blood pressure twice a day—in the morning and in the afternoon. My blood pressure has never exceeded 170, the highest ranging between 160 and 120. One week ago, they gave me a pill for hypertension. The name was something like Nifedipine sustained-release. I took it and had a headache the whole day. After that, I refused to take it." The doctor said: "We prescribed two kinds of hypertension medications for you. You must take and take them every day." I said: "The detention center only gave me one kind of hypertension medication (Nifedipine sustained-release). The problem now is that the detention center did not give me the medications you prescribed. This is the very cause of my condition worsening to today’s situation.” Then Wang Song et al. said: We will speak with the detention center’s doctor directly about this issue. During the consultation, I also told the doctors about my general situation: my entire body hurts and is swollen, and I can sleep only for one to three hours a day. That I’m holding on until today is entirely due to the appeals made by friends at home and abroad, the international community, and various human rights organizations.